Something is afoot in my language classroom this year. For the first time in 30 years, students walk in sighing with relief that they are in room 363 because it is so “chill” in here. Transition videos are the glue in between fun class activities that create joy. Other teachers using them report the same experience – one confided it was the first time she overheard students in the hall gushing about her class and the only difference is the transition videos. Try them in your class – you will be glad you did! Download a free one here! 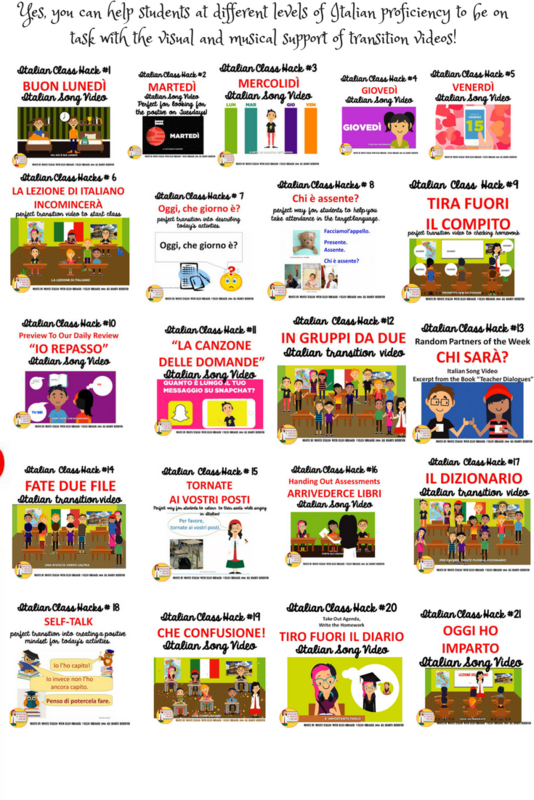 You can stay in Italian, create a 90% target language classroom and manage classroom behavior and flow much better when you take charge of your transitions – even when in a class with a wide spectrum of Italian skills.